Evidence has surfaced of North Korean leader Kim Jong-un’s Jeju ancestry after his grandfather’s memorial plaque was located in Bonggae-dong, Jeju City. The Chosun Ilbo reported on Jan. 28. that Ko Kyeongtaek was born on Jeju in 1913 and passed away in North Korea in 1999. His daughter, Ko Young-hui, was the leader’s mother, producing a child with Kim Jong-il. After the discovery on Jan 28, the memorial then swiftly disappeared in an apparent act of vandalism on Jan. 29. 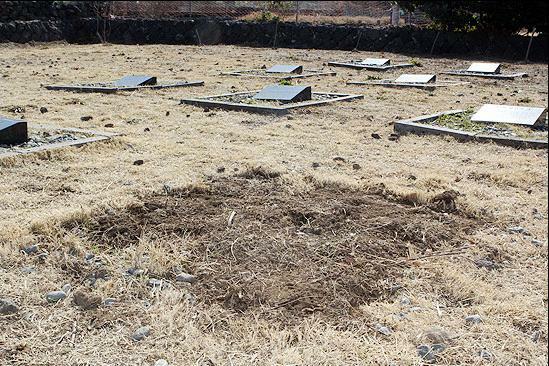 However, Jeju police announced that relatives of the deceased had relocated it for safekeeping. Ko Kyeongtaek’s body was not interned at the site, it having been buried in the North. Ko fathered his daughter, Ko Young-hui, while living in Japan, where he had immigrated to. Her birthplace in the land of the former colonizer was suppressed by the North Korean state, leading to uncertainty about Kim Jong-un’s family background. There had been suggestions of a Jeju connection, but this is the first conclusive evidence. The discovery is particularly sensitive due to Jeju’s tragic history of ideological division. Upwards of 30 thousand died in the Jeju Massacre, or 4.3, (sa-sam), an island-wide conflict between 1947-54 in which South Korean police and military units ruthlessly suppressed a popular uprising. It takes its name from April 3rd, 1948, when police killed protesters, fueling retaliatory attacks on police stations. Jeju has struggled to shake the “Red Island” tag ever since and there are suggestions that the Communist state will attempt to gain political mileage out of the issue, claiming the North Korean leader boasts revolutionary pedigree through the “Baekdu bloodline” of Kim Il-sung and the “Halla bloodline” of Ko. The unlikely story of Kim Jong-un’s heritage may not be welcome news, but it does shed light on an intriguing period in Jeju’s history and the unique chapter occupied by a little-known corner of Osaka known as “Jeju Town,” where Ko Kyeongtaek met his wife and gave birth to Kim Jong-un’s mother. The first half of the 20th century was a time of relative exodus and abject poverty for Jeju. Throughout Japanese colonization, by the boatload - often stowing away illegally - locals departed Jeju’s shores. Tens of thousands settled in the industrial city of Osaka to work in Japanese factories, it representing a land of relative opportunity at the time. More than one quarter of Jeju’s youth made the trip, continuing well after liberation, many refugees from the Jeju Massacre. The city became such a focal point of the migration that one ward, Tsuruhashi, is even to this day known as “Jeju Town.” It is estimated that 22.2 percent of Japanese-Koreans in Osaka have Jeju heritage, their story told at the Zainichi Jeju Museum in Jeju City, dedicated to the Jaeil Jejuin community, as they are known. Tsuruhashi is a typical working-class Korean-Japanese Osakan district, noted for its tight alleyways and noodle shops. You can even taste Jeju delicacies there, and to this day hear the distinctive dialect only otherwise heard in its island home. Even Jeju’s rarefied shamanism lives on, just, in this proud community. It is believed that Kim Jong-un’s maternal line were among the early waves of settlers to Osaka. Seeking work, Ko Kyeongtaek boarded a ship to Japan calling at one of Jeju’s ports. It was 1929 and he was around 16 years of age. Ko arrived into a community of backbreaking labor in local industry. Most Jeju settlers worked in the glass or rubber factories, yet National Intelligence Service records suggest Ko found work in a tailors. Kosuke Takahashi of the Asia Times claims he even "made Imperial Japanese Army soldiers’ uniforms in a sewing factory during World War II." At some point he met his wife, Cheong Ju-han (b. 1915), also a Jaeil Jejuin, and started a family. The couple looked to have put down roots in the Japanese city and had a son and two daughters. Lee reports that Kim Jong-un’s mother was born Ko Young-ja in 1952. She would spend her early years in Tsuruhashi, only changing her name to the more familiar “Young-hui” open moving to North Korea as “ja” was considered too Japanese. The Chosun Ilbo, however, put a different spin on the chapter, suggesting Ko worked in a munitions factory and was a human trafficker, for which he was deported from Japan. Lee disagrees, stating Ko lost his job as a tailor and decided to leave the country. Reports in the Joseon Hwabo, a publication of the Chongryun in Japan, suggest he ended up boarding another boat, this time to Hamgyeongbuk Province, North Korea. It was 1962. Many thousands were enticed by the totalitarian state’s call at a time when conditions in the South were dire and the North seemed to be outpacing Seoul in economic development. Morris-Suzuki states that 93,330 left Japan for the North between 1959 and 1984, following an agreement between the Japanese and North Korean Red Cross Societies. Thus inspired, Ko disregarded his roots south of the 38th Parallel and opted for the isolationist state, his young family in tow. Their life in the North is shrouded in even more uncertainty. Intriguingly however, unlike many Korean-Japanese in the North, the Jeju man’s low songbun - political caste - was not to be a barrier to success. Further, it seems his daughter was his golden ticket. After Koreanizing her name, Ko Young-hui made a date with destiny by joining a local dance troupe attached to Mansu University in 1971. The group was evidently popular and Ko - being “slim and very pretty” according to a refugee in the South - soon attracted the attention of the “roving eyes” of a young Kim Jong-il, writes Michael Sheridan, Beijing correspondent for the Weekend Australian. Their relationship blossomed and the Jeju Ilbo reported in 2010 that such was Kim Jong-il smitten with Ko that he allowed her to visit Japan in 1970 and by 1973 as a gift, an unheard of privilege. "Her visit to Japan was a present from Kim Jong Il. He basically told her to go to the Japan of her birth and buy whatever she wanted,” Kiyohito of the Asahi Shinbun quotes a Korean-Japanese as saying. As she rose to prominence and, notes Sheridan, “emerged as the most influential woman in a regime beset by dynastic rivalries,” she also produced potential heirs. Her star wasn’t bright enough, however, to temper suspicions about her birth in Japan and by corollary her Jeju heritage remained shrouded. The Chosun Ilbo reports that Ko had three children with Kim Jong-il - Jong-chol, Jong-un and Yeo-jong - and she eventually passed away of breast cancer in France in 2004. Her siblings - the offspring of Jeju-born Ko Kyeong-taek - rose to prominence throughout the regime. Her older brother Dong-hun was a diplomat and her younger sister, Yong-suk, managed Kim Jong-il’s secret funds in Geneva, before defecting to the US. Kiyohito of the Asahi Shinbun reports that the regime is constructing a myth around the Jeju people, citing a popular 2003 documentary about the Jeju Massacre, glorifying it as an anti-American Communist rebellion in support of Pyeongyang. Kiyohito quotes a Chongryon official who says Jong-un will be portrayed as “carry[ing] on the will of Jeju islanders who fought bravely under the guidance of Kim Il Sung.” Of course, having left Jeju Island in 1929, Ko was in Osaka at the conflict outbreak in the 1940s and was not involved. Lee of the Donga Ilbo also fears that to legitimate Kim Jong-un’s maternal line - “Halla and Baekdu become one” – the North Korean state will emphasize Jeju as a rebellious island and the Massacre will be painted as a collapsed revolution. The makes the discovery of Ko Kyeongtaek’s plaque in Bonggae-dong, Jeju City, unwelcome and even threatening for many on Jeju Island. The experience of communal division was felt keenly and murderously and the battle for the legacy of the upwards of 30 thousands lost souls continues. As fascinating as Ko Kyeongtaek’s path from Jeju to Pyeongyang is, it is littered with the politics of colonization, massacre and war – hot and cold - that the people of Jeju, scarred by history, may wish to let lie. Locals are thus uneasy about the morbid discovery, and its sudden disappearance illustrates that heredity, whether it brings fame or ignominy, is poisonously fractious in any fraternal conflict.